The craft cocktail was one of 2013’s biggest trends, and it continued to be so in 2014. More people flocked to quiet, hidden speakeasies or fancy bars with infused liquors and bespoke cocktails. It was the year of places like Finder’s Keepers, Niner Ichi Nana, The Curator, and The Blind Pig. Don’t get me wrong, these places are awesome, and on a night out you’ll probably find me nursing an Old Fashioned at the bar. But there are some nights where you don’t wanna slightly dress up or splurge 400 bucks on a cocktail—you just want beer in volumes, crazy characters, and loud music. Here are some of our favorite old school bars, from institutions to live venues to some straight-up dive spots. While the Poblacion area is turning into “Williamburgos”, there are more than a few bars that are bastions of what it used to be. Handlebar and Heckle and Jeckle are still fun, beer-soaked bars that will always guarantee an interesting night out. When it’s World Cup season, or heck, when any game is on, they turn into rowdy hangouts that are better with friends. Maybe even grimier is Woodman’s Head across the road, a relatively hidden place that ticks off all the boxes when it comes to “sketchy”. You have to love it however, for feeling like a crappy old pub in London. They probably have the cheapest beers in Makati too at PHP 35, and if you’re there for happy hour, it gets even cheaper. Cafe Curieux is the classier brood of the lot, and often gets forgotten these days when people talk about Burgos. But with its open space that seems to be breezy no matter what month of the year, it is always worth going to for a nightcap. I never really knew the magic of Malate and Manila because I grew up a South kid. Malate was always, to me at least, the red light district, and venturing there was as much of a trek as QC. But after one of my friends took me on a night out in the area, it easily became one of my favorite areas in the city. It is colorful, but you’ll definitely find more interesting characters here than in a crowded club in the Fort. Oarhouse is where you’ll see both local artists and backpackers mingle, sharing conversation. I get an Amaretto Sour when I’m there, and a matchbox (you’ll see what I mean). The Bar @ 1951, formerly known as the Penguin Bar, has an impressive and stellar reputation. Even people-watching here is enough for a night out, when Syquia residents come for a tipple, and bands and their troops come out to play. The place is stunning, too. If you love music, Route 196 is an institution, with some of the best local talent all making their way on stage. Heck, even The Radio Dept. has performed there. From all the places on this list, Route 196 probably houses more well-known bands (Up Dharma Down are regulars, Sandwich and Barbie Almalbis come often, and Terno artists make the bill, too), but that doesn’t mean the place is by any means pretentious. In fact, it has stayed relatively the same in spite of a change of hands, and the crowd has remained unchanged with it. 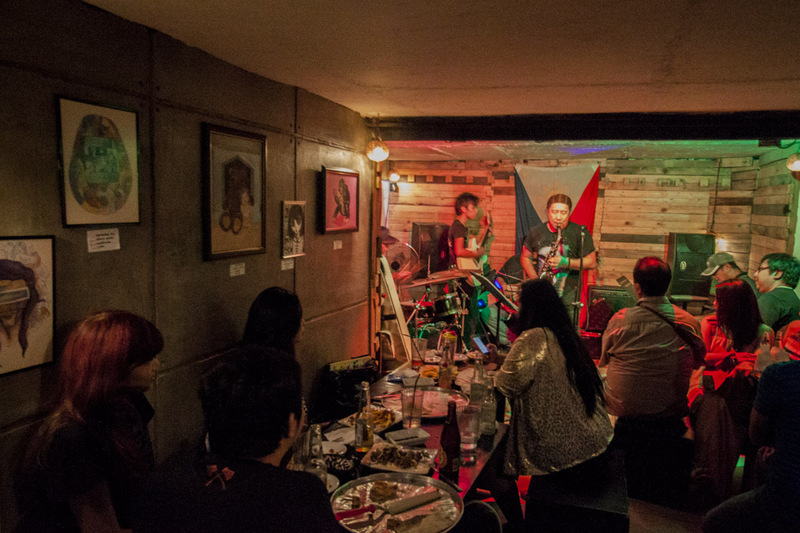 When people think of gigs or live music, they are probably most inclined to think about SaGuijo. When venues of its kind were dying and kids were flocking to the nearest club, it revived the scene and became a haven of live music in Manila. It might no longer be the place it once was, but there’s always something going on in SaGuijo. The place is tiny and now smoky and damp, but once someone plays, you’re transported to your high school or college days once again. And the food and cheap beer ain’t so bad either. Cubao X is definitely unique. It’s where people of all sorts gather, from the fashion set of Manila, to a few hipsters, to people who just love the eclecticism of the place. The collection of eccentric shops which are good for getting a vintage bargain or a weird knick-knack are what people often come to see, but the nightlife here can get exciting. There are often djs, and TodayxFuture has become popular, but Fred’s Revolucion is a whole other story. Wonderfully cluttered, it is a small space with drinks that are delicious for their price. The whole place has got a story, and is perfect for a drink late into the evening that is the right side of intimate. I haven’t been back to B-Side in awhile, but it used to be a fun, unpretentious place to hangout and listen to good music. Apparently it is less of a happening place these days, but the atmosphere and vibe of the place is still the same. It used to be the only place where you could really go out on Sundays, and have some excellent reggae music (and barbecue) to boot. It’s the original Finders Keepers/Black Market, really. There’s still a lot of cheap eats to be had here, and when there’s something on, expect it to get rambunctious and never dull. As a South Kid, this place is nostalgic for me; my best memory of 19 East ends with my friends and I lying on the roof of a car in a laughably cliché high school moment. It was a better than decent space for live music with an immense sound system, and big names were always playing here. Nowadays, 19 East is your best bet for reliving the 90’s and 00’s—it’s all about Freestyle, MYMP, and other bands of the same ilk, often sharing the same billing. Nurse your Jack and coke, secretly cry-laugh when Side A sings Forevermore, and you’ve got yourself the perfect place to bring back the memories. I’m not the “rakrakan” type, but if you are, then join all the others who flock to Black Kings almost every week. They hold mini music festivals too, where people who love all types of rock, from metal to alternative, can gather. 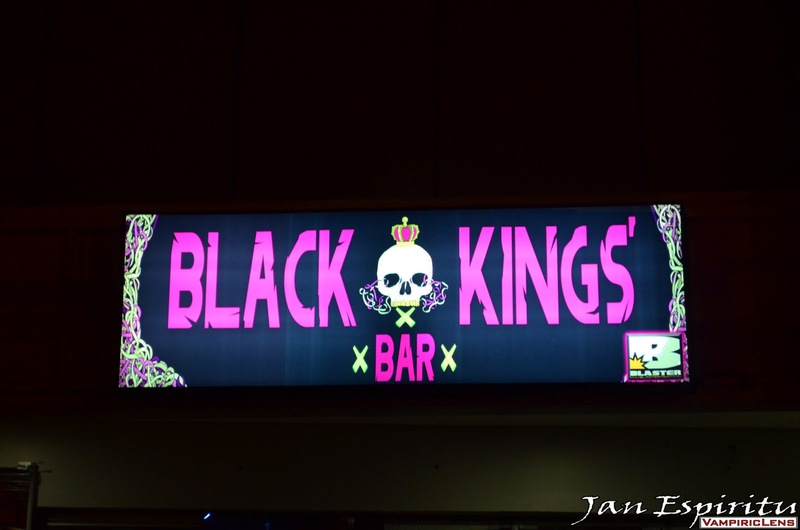 But the best thing about Black Kings is that on a regular night, its good to just sit back and drink here. It’s a little dark, there are fluorescent skulls on the walls, and the food is decent night-out grub, with hilarious names to boot. Tago Jazz Café is a spectacular, hidden place. You come here for the music, plain and simple, and with the best jazz musicians in Manila, both popular and undiscovered, regulars here. A converted house tucked away in Cubao, the draw of this place is the mystery, and how intimate it is. Everyone seems to be in on the same conversation, and the music, the starting point. It’s easy to be intimidated in a place that seems as if it’s teeming with artists who all know one another, but this is the best bar to go to if you want a good night with jazz. 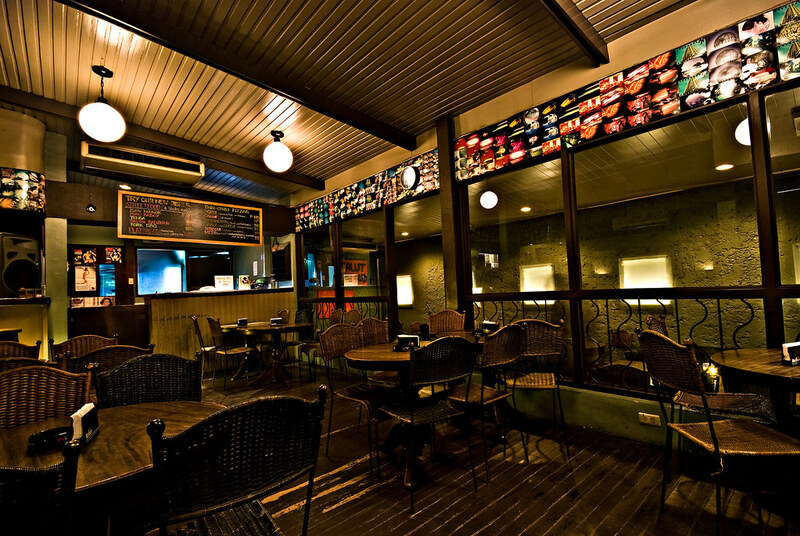 Ask anyone who’d go out during the 90’s—they’ve probably been to 70’s Bistro. And ask anyone now—if you love live music, they’ve probably been to 70’s too. One of the remaining bastions of the 90’s era venues, it’s always fun to come here and mingle in the crowd. Parokya ni Edgar became popular here, and chances are, you’ll catch a local band that’s bound to make it big in 70’s. Grab a Picha Pie, and lounge in the newly expanded space, which still feels like it used to. What are your favorite bars in Manila? Which place is nostalgic for you? Add to our list below! I love love love Fred’s! Cafe Curieux is considered old school? It’s only been around for 3 years! Bar1951 (formerly Penguin Cafe – not Penguin Bar) is one of the oldest. We’ve been around since the 80’s in Remedios Circle) it is older than 6underground and KAFE and probably just a few months (or maximum of 2 years) younger than 70’s Bistro. We are also older than club dredd/mayrics/sazi’s. Dredd Timog came before 70’s bistro. Mayrics came before us. I love the Woodman’s Head a lot of fun people there yes it does look like a crappy pub but that’s part of it’s charm. They also have several really good acoustic guitarist’s that play here including Marc Velasco. How about CRAFT Rock & Grill in the Fort? I love Tago Jazz Cafe!!! No Mayicks / Sazi’s bar? That’s place where a lot of bands came up. Also, both 6 underground locations and both Club Dredds, checkpoint bar…..hmm….this list could be longer but I suppose you can’t include every bar…. The Radio Dept. performed at Hard Rock Cafe Makati, not Route 196. It’s obvious that you’re pretending to know some things just to write something. Route 196 only sold tickets to The Radio Dept.’s gig on Hard Rock Cafe. b-collective is old school? hahaha. writer thinks old schools is 30 yrs old and below. then again, this is still quite informative. being old school, i just realized there are new places i havent visited.thank you very much ms cortez! The title of this article is misleading. Makati is not Manila. Quezon City is not Manila. Manila is Manila. Oarhouse was my favorite place in Malate when i was still training in PGH. After a wholeday in the operating room doing surgeries, all you need is to unwind and sit with bottles of beer and Oarhouse Fish and chips!